People who are thrilled with valuable colorful oriental rugs know a lot about these masterpieces of craftsmanship and all of them have heard about the Pazyryk carpet. The 2,000-year-old carpet is the oldest piled rug ever found and although many cultures raised their claims on the origin of Pazyryk, experts believe that it has Armenian origin. 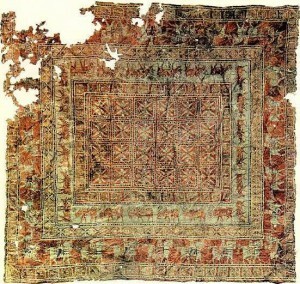 Despite the fact that the origin of the Pazyryk remains a mystery, hitherto finding makes Armenians the earliest known weavers of oriental carpets. This means that carpet weavers in Armenia have inherited a rich tradition, which has its roots thousands of years ago. There is a theory according to which, the word carpet used by European for oriental rugs derives from ‘kapert’, an Armenian word that means woven cloth. The famous historian Herodotus and traveler Marco Polo have described the beauty of these rugs and especially their red color. The Armenian cochineal, also called ordan, was the source of red natural dye. The insect was found in Mount Ararat Valley and the city of Artashat, which was a center for the production of this dye was named ‘the city of the color red’. In the meantime, the patterns and designs used by weavers, which mostly reflected beliefs and religious concepts, were the same used even in other forms of applied art such as architecture, traditional costumes, sculpture, jewelry, etc. The geographical location of Armenia between Europe and Asia has had an important role in terms of material culture influences. In oriental countries, traditionally, carpets have always been a synonym of grandeur and nobility. Carpets in Armenia were used for internal purposes, covering, decoration for horse saddles and sometimes the materials used included gold, pearls, and other valuable materials. Whether for collection or decoration purposes, a handmade Armenian carpet is a valuable piece of art to have.